"Pop" Art Camp: When we think Pop Art we think color and fun! Projects will include printing, paper mache, acrylic painting on canvas and a painted paper collage all inspired by modern pop artists like Andy Warhol and Wayne Thiebaud. Your child will enjoy this week art-exploration and you will end up with some interesting artwork to hang in your family gallery! 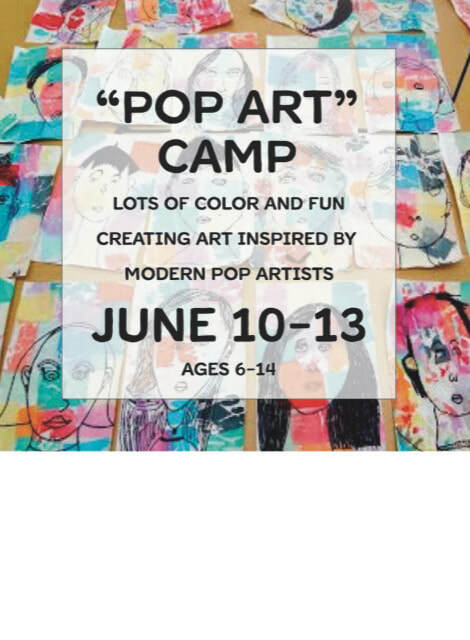 What to know: Pop Art Camp are for ages 1st grade and up, the dates are June 10-13. Morning class is for grades 1-3 from 9am-12pm. Aternoon class is for grades 4-7 1:30-4:30pm.